Earth, Wind and Fire initially wanted to release its new album around the 2012 presidential election, but the band realized it wasn't satisfied with the songs it created. 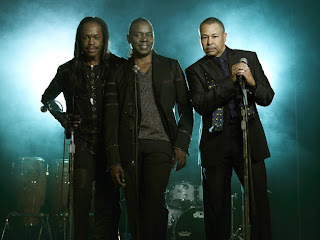 "We have a lot more bells and whistles in place now and the record is better," singer Philip Bailey said in a recent interview. "Now, Then & Forever," the group's first album in eight years, will be released Sept. 10. Bailey said the band called co-founding member Larry Dunn and others to help produce its latest sound. "I said, 'Let's go back to the drawing board,'" he recalled. "It's a great representation of who Earth, Wind and Fire is now, but not departing from the classic sound." "It doesn't sound like we're trying to be anyone other than Earth, Wind and Fire," added bassist Verdine White. The band — which includes founder Maurice White and Ralph Johnson — has worked on the album for two years. Its new single, "My Promise," was released Monday and was co-written by Academy Award nominee and Grammy winner Siedah Garrett. Fans who pre-order the album will have their names put in the album packaging. The Rock and Roll Hall of Famers are currently on a tour. Bailey said he enjoys having his son, Philip Bailey Jr., on the road and as a writer and producer on the new album. "It's a great experience to the say the least. I spend so much time away from my family and kids . (that this is) bonding like never before," he said. "He has the same passion."